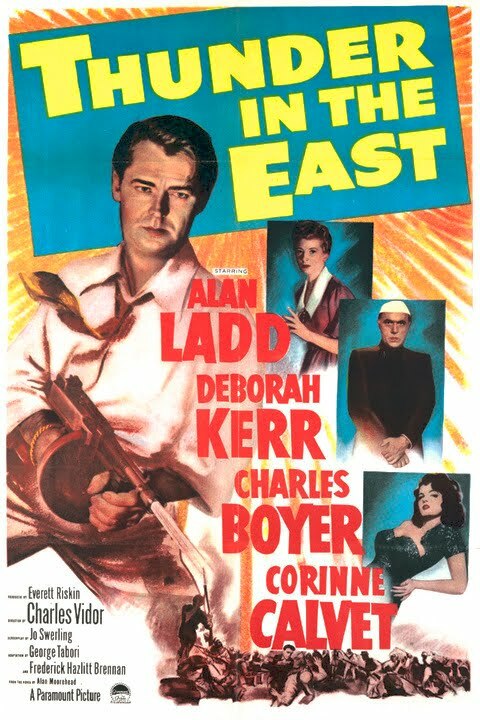 Thunder in the East is a 1952 war drama film released by Paramount Pictures, and directed by Charles Vidor, based on novel Rage of the Vulture by Alan Moorehead. The film is set in 1947 after India has gained its independence from Britain. Steve Gibbs (Alan Ladd), an American arms dealer, flies into a small Indian state intending to sell weapons to a local maharajah whose capital is facing an attack from a bandit army. He is opposed by the maharajah's prime minister (Charles Boyer), who is a proponent of Gandhi's philosophy of non-violence. He also falls in love with a blind woman (Deborah Kerr).